SAMPLE SOUND REVIEW: 63% off “Project Alpha & Bravo” Bundle by HybridTwo - SAMPLE LIBRARY DEAL! 63% off “Project Alpha & Bravo” Bundle by HybridTwo - SAMPLE LIBRARY DEAL! 5GB of Powerful Hybrid Sound Design for Epic Impact! 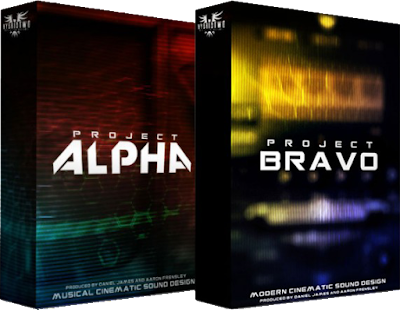 Geared towards Film, TV, Video Game composers and Sound Designers, “Project Alpha & Bravo” provides everything you need to take those epic tracks to an entirely new level! “Project Alpha” is an intuitive and powerful hybrid musical sound design sample library aimed primarily at Film, TV, Video Game and Media composers. The library has been designed to effortlessly layer in with your workflow, allowing you to load in a few Kontakt patches or drag the open WAV files into your DAW to give your tracks that modern hybrid sound. Based around a custom Native Instruments Kontakt 5 script, Project Alpha allows for quick and easy customization of any of the library’s patches. You have the ability to add and manipulate a range of FX at the click of a button, as well as the option to easily EQ out unwanted frequencies or adjust the amp and filter ADSR. All of this is laid out on a single synth-like front panel, making it very fast to pick up and start tweaking. Also built into the custom GUI is a flexible ostinato-style step sequencer and gate sequencer allowing you to easily turn any of the library’s sounds into a rhythmic sequence. “Project Bravo” is the follow up to the critically acclaimed “Project Alpha”. Like it’s predecessor, Project Bravo features an intuitive and highly flexible custom-scripted User Interface. Features include a custom ostninato-style step sequencer and gate sequencer, as well as an all new Dual Control sequencer, which allows you to transform any sound into a kinetic, pulsing rhythm. Also included is an incredibly useful MIDI drag feature, which allows you to turn step sequencer notes into a MIDI file that you can drag to your host DAW, right from the front panel! This is great for very quickly layering Project Bravo sequences with other libraries. A range of FX, EQ and Compressor are all accessible on the front panel. The one-page philosophy returns with Project Bravo, making the library very fast to pick up and start creating. THIS IS AN AWESOME SAMPLE LIBRARY DEAL ! !